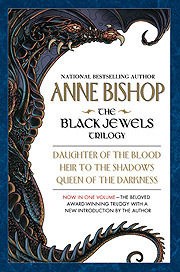 For synopses of the individual books, check out the book pages for Daughter of the Blood, Heir to the Shadows, and Queen of the Darkness. Mesmerizing...a fascinating, dark world...definitely worth checking out." "Lavishly sensual...a richly detailed world." "A uniquely realized fantasy filled with vibrant colors and rich textures. Ms. Bishop holds us spellbound from the very first page."